During my time in South Africa I spent a weekend down in Jeffreys Bay, this trip was organised by our volunteer house and all of us went. 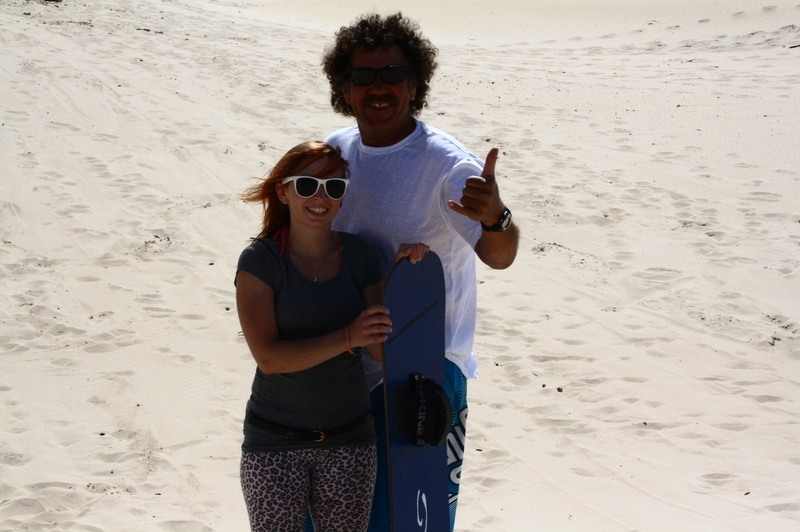 They drove us there and back, as well as arranging a sand boarding lesson all for about R100. We headed down ‘early’ one Saturday morning – one thing you’ll learn in South Africa is no one is ever on time they say 9am leave normally means 9.45 – and went straight to sand boarding. We were kitted up with boards the thing was nearly as tall as me! Then we headed up to the sand dunes with our instructor. I have never surfed or skied before, so I was pretty nervous to say the least. The dunes were beautiful, lush blue sea around you for miles the bay was so pretty from where we were stood what an idyllic place to get to see let alone sand board looking at it. We had a good half hour instruction on how to sand board, how we should stand – bum out, head up, back straight – learning how to move our weight around the board despite having out feet strapped in, and most importantly how to keep our balance. We then had to wax the bottom of the board something which had to be done every 5 – 10 go’s as the wax quickly gets eaten off. I was so sure I was going to be horrific, I couldn’t even stand up once I had strapped my feet in but after just one go and staying on the whole way I was feeling a lot more confident. Soon we were all let loose on the dune, so you had to watch out for the others around you too but oh my, it was so much fun. Some people were falling off every go but the ones that did get it could move on to a higher and harder dune, that’s where it all went wrong for me. I would get too much speed from the higher start we had on this dune and ended up eating sand every time, but still it was the fun that counts. After some bum board races, covered in sand we headed back to the buildings to return the boards, remove the sand and grab the lunch which was included in our price. In a wooden hut with sandy floors and windows with no glass was where we would have lunch, it was a great looking place well decorated and cool vibe. The food was pretty good too and they even had a bar. From there we headed to our hostel, but on the way through town we took a pit stop at the Billabong factory outlet store, the same great clothes just a whole lot cheaper. I brought jeans and a bikini for under R300 – I could have spent so much more but it was only my second week of my volunteer trip I couldn’t spend it all yet! So after a lot of waiting around for the slow shoppers, sitting in the sun and being stopped by street kids who wanted money, we finally got on the bus and headed for the hostel. Island vibe was set slightly out of the main strip of J-Bay, at what is called the ‘kitchen window’ the view again was amazing you could see all along the bay from up here. From the moment we walked in, we had a friendly welcome by staff and other people staying there. We paid R120 each per a dorm room, the boys would be in one room and the girls in another, they were mixed dorm rooms but it was the way our leader wanted us split up…as if we would stick to that. Some of the girls got one of the private beach houses, which over looked the beach with a balcony but that was over double the dorm room price. Once we had looked around the hostel, found the bar and food area we headed to the beach to find the super tubes. We walked along the beach from the hostel but no matter how far we walked we never came across any, this was pretty disappointing as we were all hyped up for seeing some of J-bay’s most famous waves. We decided to give up turn back and go for a swim with the idea of trying again tomorrow. The Indian Ocean was pretty cold and pretty rough for someone as little as me so I didn’t go in far, but as we were still covered in sand from sand boarding it was pretty nice! And so we went back to the hostel got changed and started the night, it was barely 5pm but what did that matter! Soon the whole of our group from the volunteer house had got together, taking up half the benches in the food area. 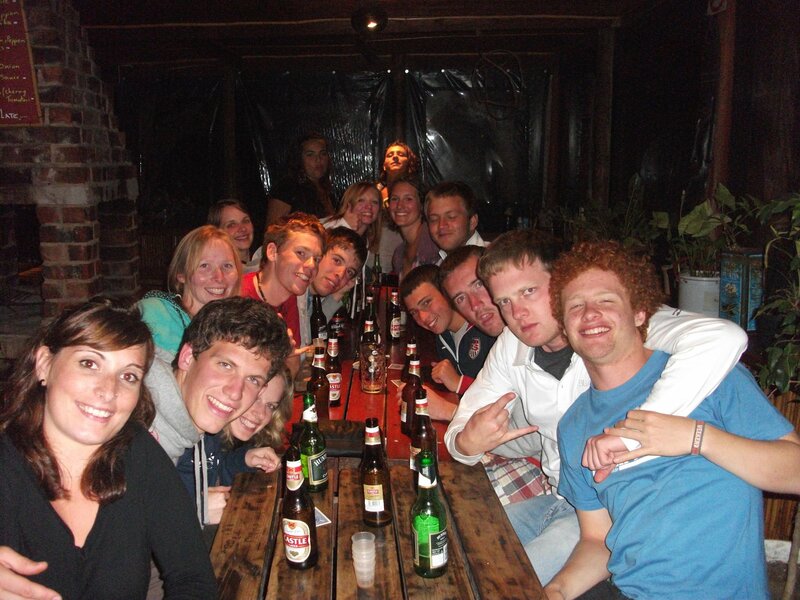 The night started steady with beers from the hostel bar which was pretty cheap! We ordered food from that night’s menu which was pizza, again a great price the only problem was there was a huge wait on the food order so by the time we got our food, most of us had had a beer too many. The rest of the night played out like this, we had a mass game of ring of fire – combining American and English rules making it one horrific game! Then there was the shooters challenge – the bar sold 10 different shooters and you could get all 10 for a discount the idea was who could drink all 10 and still stand. They were strong and oh so gross! Needless to say after them some people weren’t still standing. Whilst we had been partying the night away with our group we had failed to realise the crowd gathered in the bar and soon it became a whole hostel party, which I don’t remember too well except sleeping in the wrong dorm and some random dude being in my bed! The next morning everyone felt very hung over and ill, we were meant to have surf lessons, but due to the wind, lack of swell and our hangovers that didn’t happen. We just put our bags in their storage space and spent the day on the beach until it was time to head back to PE. This weekend was one of my best memories of South Africa, sand boarding is such a fun and cool thing to try if you ever get the chance, the atmosphere in the hostel was like no other hostel I have ever stayed in – it was like the place became a house party. The only disappointment was we never got to see the super tubes! 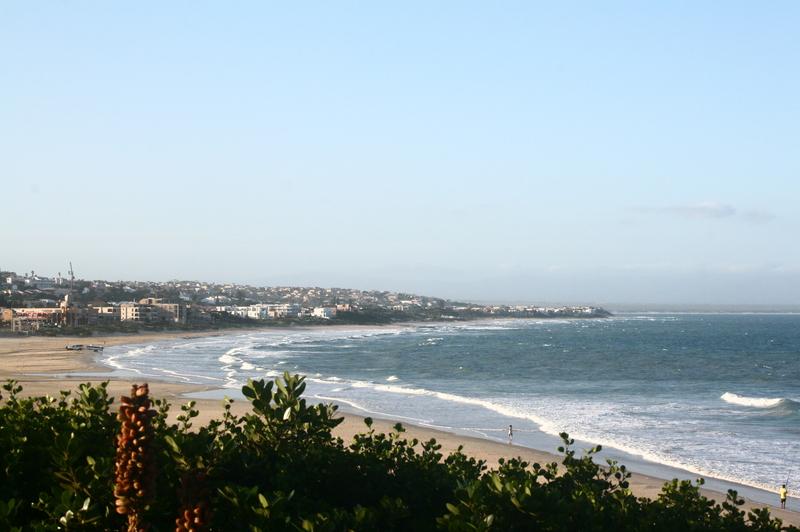 I would highly recommend staying at Island Vibe, if you are planning a trip to J-Bay. At the time of writing R10 was equal to a £1.